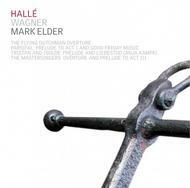 This disc includes the essential orchestral works from Wagner operas, for which the Hallé have been highly acclaimed in concert performance. Hallé and Elder are joined in the Tristan and Isolde Liebestod by soprano soloist Anja Kampe. Specialising in Wagner roles, she is an artist with a proven pedigree and an immense career ahead. Elder is recognised as one of the leading opera house conductors, and brings great experience of the theatre to Hallé’s concert performances and recording. He was Music Director of ENO until 1993 where his outstanding work was recognised with an Olivier Award and has conducted at the world’s leading opera houses including the Royal Opera House, the Met, Opéra National de Paris, Lyric Opera of Chicago, Glyndebourne, Bayerische Staatsoper Munich and Wagner’s own Bayreuth Festival. “It is clear that [the Hallé Orchestra is] capable of delivering one of the finest concert performances we are likely to hear in this country”. Independent on Sunday, reviewing a Hallé concert of orchestral works from Wagner operas, as performed on this disc.